Pasta is most definitely the center of the Italian gastronomic universe. 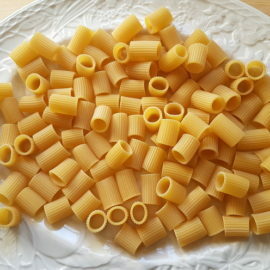 There are many views on how many different pasta shapes there are. Some people say 360+, others reckon there are far more. According to an article I read, the most well-known Italian pasta makers produce a varied number; Divella produces 140 types, De Cecco as many, Barilla about 50, Buitoni over 60 and Agnesi about 40. 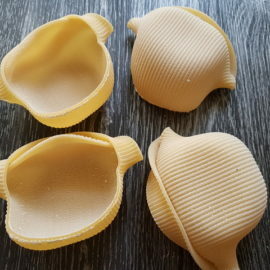 However the names of different pasta shapes can vary depending on the region or the manufacturer. Sure, spaghetti are always spaghetti, but fusilli are sometimes called eliche. Tortiglioni (maccheroni with grooves that curve around the pasta) are elicoidali for some, while in Umbria they call them boconotti, which in a large part of southern Italy are actually filled with cream, chocolate, almonds and jam. They sound delicious, however, you would never want to eat them with ragu! Spaghetti or Maccheroni alla Chitarra? The reason that I am mentioning this difference in names is that although ‘maccheroni alla chitarra’ is a classic southern Italian pasta originating in Abruzzo, in Northern Italy it is called spaghetti alla chitarra because maccheroni is the name the Northern Italians give mostly to short pasta tubes. But what’s in a name! The difference here is in how this pasta is traditionally made.‘Chitarra’ means, yes you’ve guessed it, guitar! The reason for this is the piece of equipment used to make this pasta. The chitarra is a rectangular wooden frame with parallel wires running across it from top to bottom. 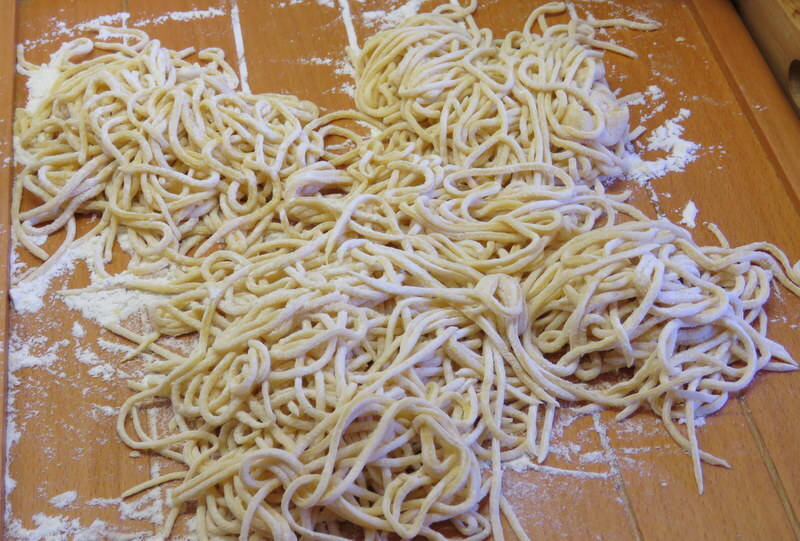 The rolled out pasta dough is placed on the chitarra and pushed through the wires by rolling a rolling pin over the top of the dough. Pasta makers in Abruzzo release the pasta strands from the wires by ‘playing’ them as they would a stringed instrument! The resulting pasta looks like square spaghetti and has a porous texture. 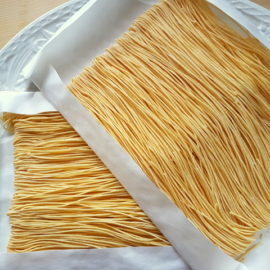 There is a similar type of pasta made in Lazio called tonnarelli and a thicker version called cariole. Some commercial pasta makers produce an egg free dried variation which is sold in other parts of Italy and abroad. The chitarra was apparently invented in 1890 in the Abruzzo province of Chieti, before that pasta was cut using a special rolling pin with notches in it for the shape. Recipes for pasta alla chitarra. 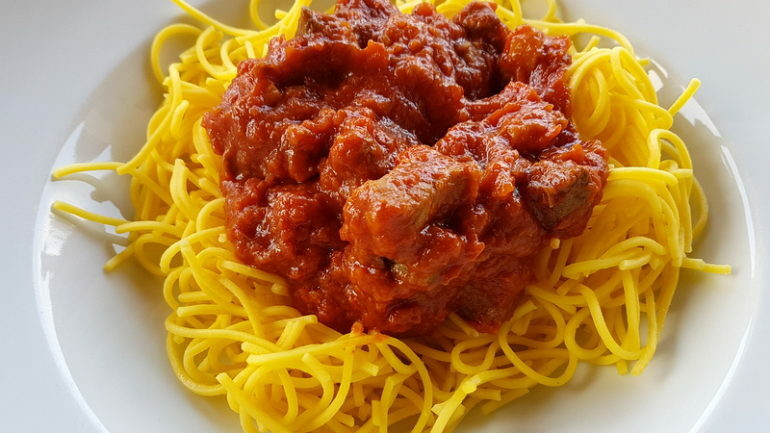 In Abruzzo, maccheroni alla chitarra is typically eaten with a mixed meat ragu which includes lamb and tomato sauce seasoned with peperoncino or a lamb ragu with sweet peppers or with tomato sauce and tiny veal meatballs called pallottine. It is also often served with a simple spicy tomato sauce or with pesto Abruzzese which is a spicy pesto made with peperoncino, sundried tomatoes, black olives, pecorino and anchovies. 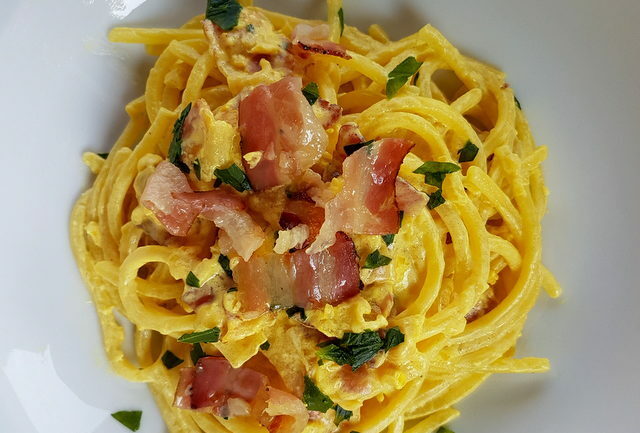 I am planning to post more alla chitarra recipes soon but until then you can take a look at my alla chitarra with saffron and pancetta, another delicious recipe from Abruzzo. In the meantime if you’d like to give making this pasta a try I’ve posted the recipe and you can buy the chitarra online from various sites, including Amazon! Delicious homemade long pasta from Abruzzo made with a 'chitarra'. Put a pinch of salt and the beaten eggs into the center of the well. Mix together well. You can decide whether to add or remove some of the flour depending on the consistency. The dough must be quite solid, but not too hard. If it is too dry you can add a little water. You need to knead the dough for as long as possible and as vigourously as possible. Pour some drops of oil onto the palms of your hands to finish off the kneading. Leave the dough to rest for at least a couple of hours in a lightly floured container covered by a plate or in cling film and placed in a cool place away from draughts. 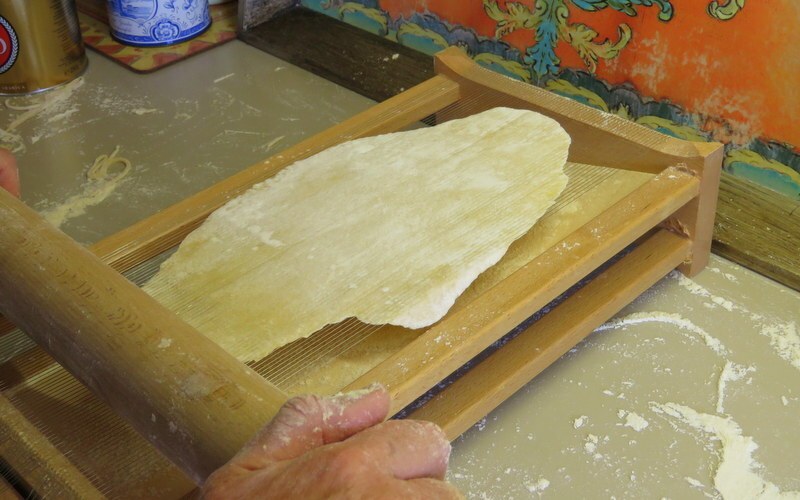 When the time is right, roll the dough out into thin sheets to be cut into strips as long as the width of the chitarra. Place a sheet on the chitarra. The spaghetti will fall through cut into a thin squared strips. If any strands of the pasta are left hanging on to the chitarra, a simple strum with a finger across the wires will help to loosen them. 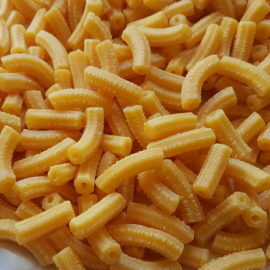 Cook the pasta in a large pot of boiling salted water for a few minutes until al dente. 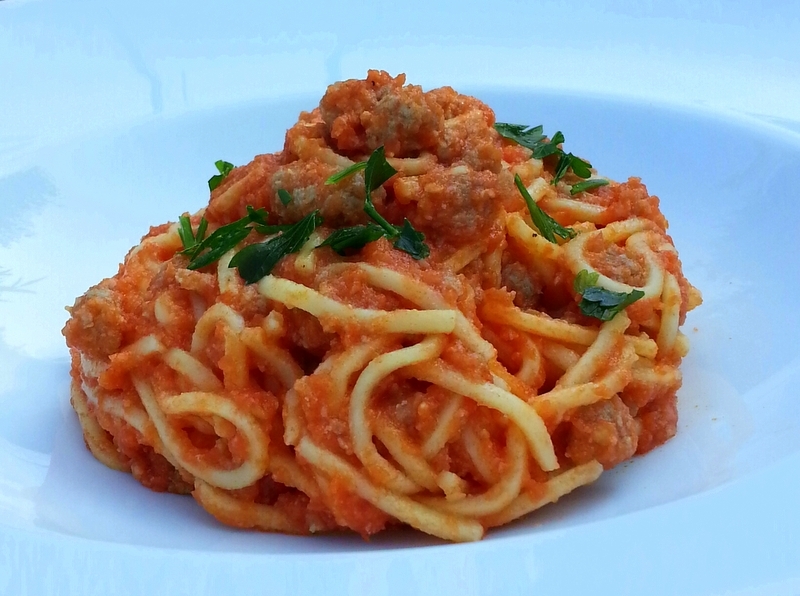 Drain and toss with a traditional Abruzzese ragu served with grated Pecorino cheese or a simple tomato sauce with peperoncino if required. You can buy a chitarra pasta cutter from Amazon.